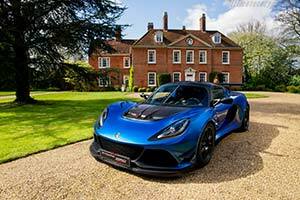 Evolved from the hugely successful and capable Exige Sport 380, this latest Lotus supercar is the purest manifestation yet of the company's Cup concept for sports cars. Genuinely eligible for competition yet undeniably elegant, just 60 editions of this extreme Exige are planned for worldwide markets - assuring its status as one of Lotus' most collectable road cars. With a purity of drive unheard of in road cars, and a power-to-weight ratio of 355 hp per tonne, the Exige Cup 380 delivers genuine race pace, with 0-60 mph in 3.4 seconds (0-100 km/h in 3.6 seconds) and top speed of 175 mph (282 km/h). Key to the Exige Cup 380 reaching its low weight of 1,057 kg is the comprehensive adoption of carbon fibre and extreme engineering. Making their first appearance on a road-going Lotus, heavily revised bodywork elements contribute to the increased downforce of the Exige Cup 380, with the car generating up to 200 kg, 43% more than the Exige Sport 380. Making the most of this aerodynamic downforce and maximising mechanical grip, the Exige Cup 380 features larger rear tyres (285/30 ZR18 Michelin Pilot Sport Cup 2) as standard. Jean-Marc Gales, CEO, Group Lotus plc said, "Developing the Cup 380 has allowed us to indulge our motorsport ambitions on a car that can be used and enjoyed every single day. This is an Exige that's not just unbeatable point-to-point but also capable of winning highly competitive races. The biggest surprise for many is that it's fully road legal - a considerable achievement considering the car's performance capabilities. Unlike some rivals' cars, this is something that really can drive to a track, set the fastest lap and take the win, before heading home. It's supremely usable, yet outrageously fast." At the heart of the new Exige Cup 380 lies a concept from the core of one of Lotus' founding principles. With an unrivaled lineage, the new thoroughbred Lotus Exige Cup 380 is endowed with race car sensibilities and road car manner. Honing the Exige Cup 380's high speed abilities was paramount in its development, and the inclusion of new wind tunnel developed aerodynamic elements allow this road-going Exige to deliver up to 200 kg of aerodynamic downforce at a top speed of 175 mph. Located over the wheels, the front louvers equalise the pressure differential within the wheel arches, increasing downforce at high speed and under hard braking, whilst the cut-out sections behind the rear wheels work with the aero blades mounted either side of the race diffuser. Even the Exige's windscreen wiper has been aero tuned - now resting in a vertical position to avoid disrupting air flow. To harness the huge hike in downforce, and provide increased mechanical grip, wider 285/30 ZR18 rear tyres are required - a step up from the 265/35 ZR18 as fitted to the Sport 380. With the two elements working in combination, this huge boost in grip allows the car to corner harder and faster which, given with the Exige's existing reputation as a driver's car, elevates it to a whole new level. An integral part of the car's aerodynamic prowess, the high-gloss, hand-made carbon fibre components include new front splitter, front access panel, bargeboards, roof, diffuser surround, new larger aperture air-intake side pods, a new one-piece tailgate and a straight-cut high efficiency motorsport derived rear wing. The new design one-piece carbon rear tailgate reduces weight by 6.5 kg and the removal of gas struts deletes 1 kg. The new carbon side pods save a further 0.5 kg.